Hyacinth Bucket was the star of the successful British sitcom Keeping Up Appearances (1990-1995). Thanks to her long-suffering husband Richard, Hyacinth had a comfortable lifestyle. But, during the recent recession reality caught up with fantasy. Some likened the imprudent behavior of many recession-hit Brits to Hyacinth Bucket who went to extraordinary lengths to impress her neighbors (including pronouncing her name “bouquet”). Now, the British are suffering from the Hyacinth Bucket Syndrome. 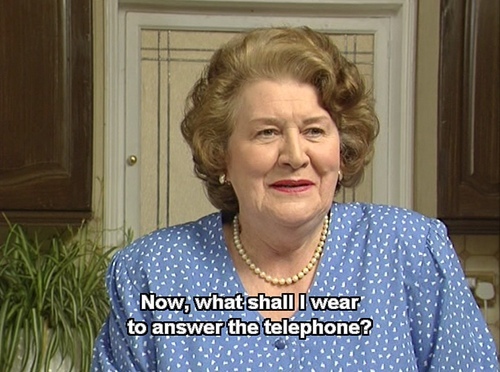 The sad truth is that, as outlandish as Hyacinth’s behavior seems, she is, at least to some degree, an accurate representation of the small section of the British middle class that are both socially-obsessed and snobbish. Perhaps we all have a little bit of Hyacinth in us. Nobody really wants to leave their confort zone, do they?